Foster Campos was an amazing craftsman. Starting back in the late 40’s and early 50’s he worked for Elmer Stennes and essentially designed and fabricated all of the wood clock cases for Stennes clocks. 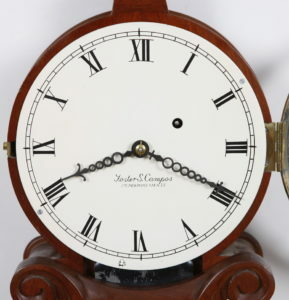 After Stennes’ death Foster launched his own business beginning in 1977 and continued in the tradition of hand made “YANKEE” clocks up until his passing in 2007. This is the rare “Curtis & Dunning ” Lyre timepiece and its perhaps Foster’s greatest achievement with incredible acanthus leaf carving in the throat frame, carved presentation bracket and carved leaf finial. 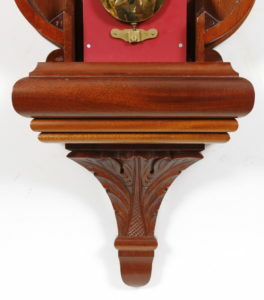 The original clocks by Lemuel Curtis are certainly one of the rarest hardest to find clocks for a collector to acquire and that made them a prime candidate for skilled clockmakers and carvers to reproduce. 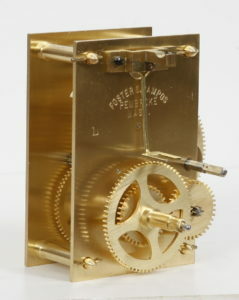 This is the W #4 Curtis Lyre Clock as designated in the trade catalogs and he made this example for Stennes from the late 1940’s up until Elmer’s death in 1975, and after that under his own name in his own shop in Pembroke MA. 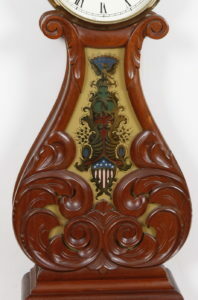 The superbly hand carved, 40″ tall, mahogany case is a very fine reproduction of a ca. 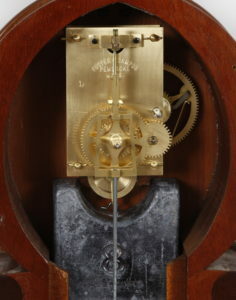 1830 Lemuel Curtis Lyre Clock. The 7 1/4″ dial is signed Foster Campos, Pembroke Mass. and has the trademark “pine tree” outside the chapter ring. 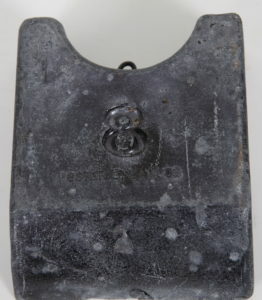 The 8 day weight brass movement is powered by one of his cast lead weights with the #8 in the casting and cast into the pattern is his name “Foster S Campos.” All of the “metal” parts: bezel, hinges, tie down were acquired by Foster after the death of Stennes. 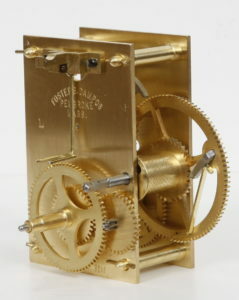 The eight day weight driven brass timepiece is signed on the front plate “Foster Campos, Pembroke MA” and this movement was made in the USA and the serial number on the movement indicates it is from the period after Bill Kilbourne co-owner in the famous Kilbourne & Proctor firm sold the Waltham MA business. In the 1987 Mr. Kilbourne transferred the design/tooling/fixtures/know-how/parts/semi-finished movements etc. to John Grass and production resumed in CA. Special thanks to my old friend David Howard who provided the research and insight into this movement It mounts to the backboard from the behind with a single, center bolt. The glass with American shield decoration is original and in excellent condition. . All in all, a very collectible and attractive weight driven timepiece in original estate condition fresh from a Main Line Philadelphia Estate. This is the 11th clock made by Mr. Campos in the year 1989 as numbered in the inside of the case.